Invest in a home security system to make your home safer and deter future burglars. 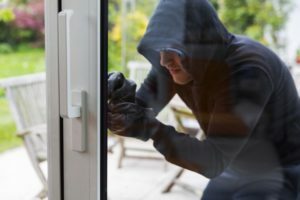 If your home was broken into, you’re not alone. Roughly two million home burglaries are reported annually in the US.1 It’s frightening to be the target of a burglary, and you might feel rightfully distracted or hazy in the hours and days following the break-in. Taking the following steps will help you get your life back in order so you can start moving forward. Your safety is more important than any belongings in your house. If you see any signs of a break-in, don’t go inside. Stay in your car or go to a neighbor’s house to call the police. If you’re already in your home, try not to touch anything that might be useful to the police as evidence––it could end up helping them catch the burglar(s) and recover your stolen property. When the police arrive, go over everything that was stolen or damaged during the burglary. This would be a good time to pull up any security camera footage of the break-in if you have it. An accurate police report will not only help with the investigation but also help back up your insurance claim. Whether you own or rent your home, you should be able to recoup most of your losses with homeowners or renters insurance. You don’t necessarily need a full copy of your police report, but your insurance company will need some of that information to process the claim. An adjuster might come to the scene to investigate the break-in and confirm the value of your claim, so you might want to find somewhere else to stay until they show up. You don’t want to make any immediate repairs to your property that you don’t want to pay for yourself. When the adjuster arrives, be prepared to back up your claims as best as you can. They’ll likely ask you specifics about the break-in, including the value of the stolen or damaged items. Even if you don’t notice any personal information missing from your home, you’ll want to take some preventive steps to stave off any attempts at identity theft. Carefully look over bank and credit card statements in the weeks following the robbery to confirm there is no suspicious spending on your accounts. You should also order a free credit report right after the break-in to monitor your SSN for any new lines of credit taken out after the break-in. Because identity theft can be so damaging to your personal finances, we recommend using a professional identity theft protection service. These services will professionally monitor your credit and can help you catch any suspicious activity that you might not see on your own. They also often come with insurance that will compensate you for out-of-pocket expenses associated with your identity theft recovery. When you’ve taken care of the essential steps above and the break-in has been documented by the police and your insurance company, it’s time to restore your house to its original state. Clean up messes or clutter left behind by the burglar. If any windows or doors were damaged during the break-in, make the necessary repairs to make your home feel secure again. Being the target of a burglary is an unsettling experience that makes your home feel less safe and homey. But you deserve to feel safe and secure in your own home. If you don’t already have a home security solution in place, it’s worth looking into how home security systems can protect you from future break-ins. The emotional toll brought on by a home break-in might linger for days, weeks, or even months––and that’s perfectly OK. Moving forward from such a traumatic experience isn’t easy. But you’ve taken all the steps to make your property more secure than ever before, and soon you’ll start to feel safe again in your own home.